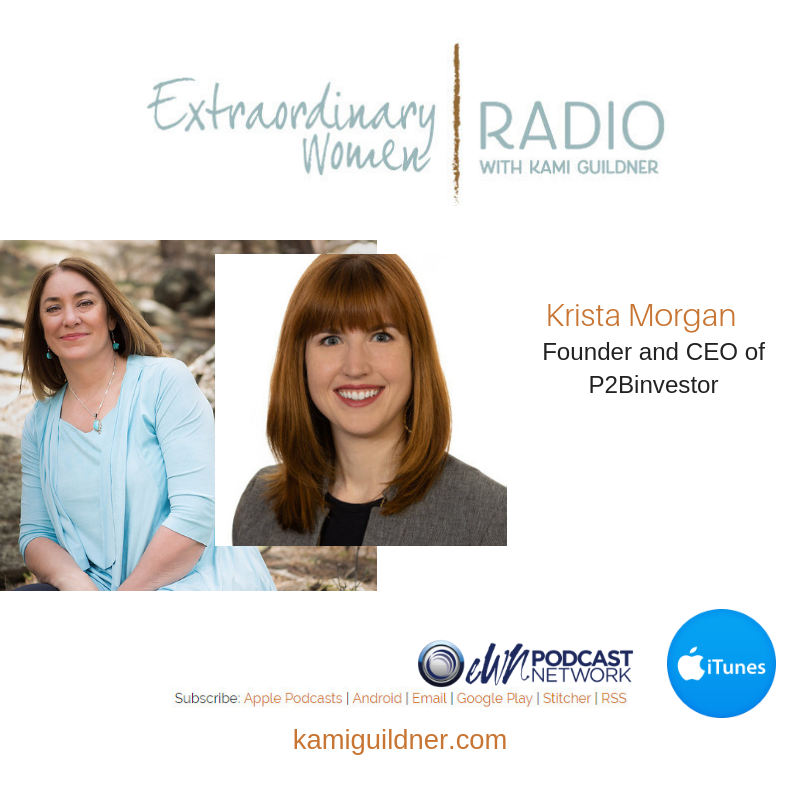 Today’s Extraordinary Women Radio interview is with Krista Morgan the Co-Founder and CEO of P2Binvestor, a marketplace lender that helps entrepreneurs and innovators transform their companies from sector newcomers to industry leaders. Krista shares her stories of starting P2Binvestor – a financial tech company – when she had no prior experience in finance or tech. She saw a gap in the market place and jumped on the opportunity. With only 2% of venture capital funding going to women founders, Krista is passionate about changing this number! She shares how she raised $13 million in capital to fund P2Binvestor through angel investors vs. the traditional venture capital route. It’s an impressive story! We have a rich conversation around funding startups, business building, sales, feminism, doing business with family, and life wisdom in general! P2Binvestor partners with banks and investors, while also offering a robust crowdfunding platform, to provide affordable, flexible capital that evolves with business growth. Krista has quickly grown P2Binvestor into a multimillion-dollar company and one of the few tech-enabled commercial lenders that can rapidly underwrite and fund million-dollar lines of credit. In addition to being the CEO of P2Binvestor, Krista is co-host of the popular podcast, Women Who Startup Radio, a global networking and learning platform for female entrepreneurs and innovators. You’ll want to check that out! To learn more about Krista, follow her on LinkedIn or visit the P2Binvestor website. Let’s meet Krista Morgan, the founder and CEO of P2Binvestor!